I want to live a life filled with quality. A life that has value and meaning. I think most people want to have these basic common descent things in their life. People who love them, people they can love, friendships that last with people you can trust. My mom has had a quality life, that is a life that has been filled with great friends and good family. She taught me many things throughout the course of my life. To respect others, to cherish family, to believe in a higher power, I think these are the basics. The fundamental essentials that form a human being in my opinion is what they believe in and what matters to them. Almost as important as your belief structure is your environment. Where you were raised the things you were part of, in contact with and the things that you see as the years change you into who you are today. I recently went on a Manhattan hotel tour. ​The Library Hotel Collection is an absolute must. I could tell you about the long list of amenities these hotels offer. Penthouse bars so chic and exclusive that everyone from royalty to celebrity has probably made a toast to some celebration or another. I am not royalty or a celebrity but I am a dreamer and I have a very rich fantasy life where at any moment I can be whoever I want to be. When staying The Library Hotel it makes it very easy to disappear and become who ever it is you want to be. In fact I can guarantee you that most of the guests are just regular people like you and me. Hard working people with jobs, families, responsibilities that make taking a vacation a requirement instead of just a novel idea. 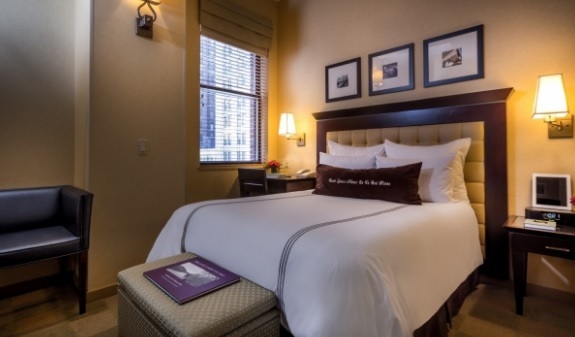 Four theme based locations throughout Manhattan make these hotels not only convenient to all of the major happenings in the city but also offer guests a variety of clever ideas to choose from. 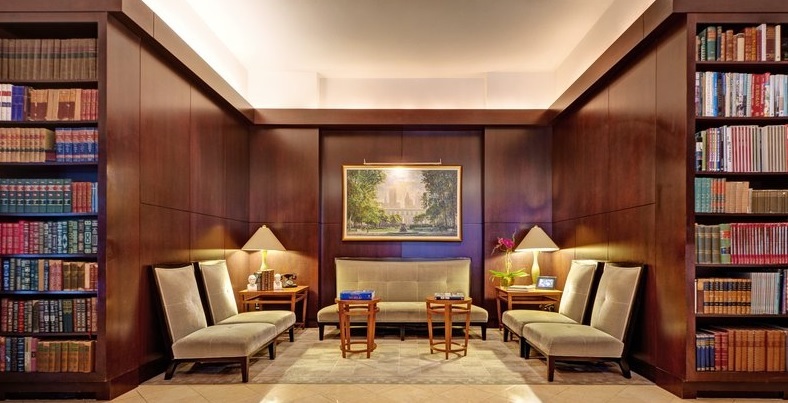 They also all offer a generous club room service with complimentary all day refreshments, from free breakfast to a three hour complimentary wine and cheese reception each evening. Along with free bottled water and free wifi, this group puts guests first, rejecting the trend to charge extra for everything, so common in travel today. The Casablanca Hotel is right in the center of Times Square and leads the imagination to the film which has made it so famous. of being able to look over the city from a great height. By being witness to a very famous fashion event starring the Fashion Designs of Brandon Maxwell and appearances by gorgeous models and a celebrity sighting of Lady Gaga. Last But Not Least the Aria Hotel Prague and the ​Aria Hotel Budapest These five star hotels offer exquisite design inspired by music just as the Library is inspired by literature, located in destinations I look forward to experiencing in the near future. The Library Hotel Collection also has a new urban resort opening in Canada next year, called Hotel X Toronto which I hope to try as well. The Library Hotel my 2nd favorite, (The Hotel Giraffe being #1) of the 4 hotels is like magic from the minute you enter the lobby with its book lined walls and faux "Card Catalogue" reception area, to the moment you step off the elevator onto one of the floors of the Library Hotel and the first thing you see is a laser light on the wall that spells the classification of the Dewey Decimal System that floor is dedicated to. I stayed on the technology floor. Each room hold s a library of 50-150 books on a unique topic within that classification . imagination and subconscious to think and create amazing things. The child in me to create something fantabulous. Lends itself to luxury and comfort - If you have these two ingredients then you have 75% of what you will need to have the ultimate hotel/ vacation - experience in my opinion. My evenings are always glorious and filled with excitement when I stay at one of these hotels. The Library Hotel was my most recent adventure and I invited a friend from Morocco to join me on this trip into the lights and atmosphere of this great city. I also invited some other friends to meet me for cocktails in the penthouse bar of the hotel. We noshed on some very special appetizers one of which was the most delicious mini cheeseburgers made with the finest quality beef tender and delicious. It was a misty evening and looking out over the midtown landscape from the penthouse roof was spectacular. The Bright lights of the skyscrapers were dimmed as if to set a mood for my guests and myself. The room she and I stayed in was as always neat clean, chic and extremely comfortable. With a Queen sized bed and Egyptian linens and Duvet tucked in so tight part of the pleasure was just pulling the sheets down from their orderly presentation and immerse myself in complete sleepy comfort. The Next day was rainy and downcast so my guest and I took the elevator to the penthouse Bookmarks Lounge where there are many books, big comfortable couches and a huge fireplace and a glass enclosed terrace on one side. On the other side called the Poetry Garden, there is a glass enclosed sitting room with a wrap around outdoor terrace. With the misty clouds and rain passing by we sat by the fire deciding what our day would hold. I decided to walk over to one of the many shelves and pick a book to read from. ​As I am in the process of procuring a literary agent I said to her I wonder what makes a popular book so popular, I bet all these books open with a stunning opening sentence. I read from several of the books and I was right each one delivered an opening paragraphs that grabbed you and invited you to continue the journey. We ate at the cafe restaurant in the lobby Madison & Vine for lunch. I ordered the Cobb Salad and several Glasses of Sauvignon Blanc, What is it about fine dining and the almost impossible task of recreating the taste of these delicious meals at home? Maybe a story for another time. The rain continued to hold us under its spell and I daydreamed looking at the people rushing by outside to try to find a dry place to escape the cleansing the skies were gifting the city with. My guest continued to talk on about things I just could not seem to wrap my head around, I guess marriage was probably not an option, se la vie’ I enjoyed the good things she had to offer a generous disposition and a lovely figure. We dined that night on Park Avenue at the Library Hotel Collections signature restaurant Bread & Tulips, rustic Italian food served in a mood lit space downstairs from The Hotel Giraffe and the amazing adventure continues. ​Braised grilled Octopus for the appetizer and a PAPPARDELLE braised leg of lamb, tomato, parmigiano for the entree accompanied by a Fine Italian Red Wine and Cosmopolitans for desert. We were offered a dessert list but the food was so rich and filling it left little room for the dessert selection. The rain continued to fall and we decided to walk back to the hotel. I could hear singing in the rain playing in my head as we traveled up Park Avenue by foot, a although my guest for the evening did not seem as amused as I was. After returning to the luxurious room she took a hot bath in the beautiful stone granite and wood spacious retreat. She emerged refreshed and ready for more stories of love and enchantment. Whew! Thank you The Library Hotel as my patience wore thin and I could absolutely could not endure one more ounce of negative energy. This was the end of the adventure at The Library Hotel but there were still 2 days of fun and frolic left to experience at The Hotel Elysee stay tuned for that article and much more romance to come.